2013 WARGAMERS Look What Santa Grogs Sent Me! Welcome to the 6th annual edition of the "Look at what Santa Grogs sent me!" list. 2012 was the largest one yet with 148 participants. This makes the wargamer secret santa the biggest one outside the main BGG wide one. for running the exchange this year. This year's microbadge will be automatically awarded to participants. 2012 WARGAMERS Look what Santa Grogs sent me! 2011 WARGAMERS Look what Santa Grogs sent me! 2010 WARGAMERS Look what Santa Grogs sent me! 2009 WARGAMERS Look what Santa Grogs sent me! So, for all of us obsessive compulsive types, especially the ones who fret "did my secret Santa gift actually arrive? ", this is where you can post what your secret Santa sent you. Please only make an entry when you actually receive the present! If your Santa sends you more than one item, just list them all in one listing unless you think it makes more sense to list them separately. Remember to include any comments you want your Secret Santa to know! I thought that it was the items for my target so I opened up the package thinking that there would be enough time to wrap, pack, and ship before the weekend. At first confusion, then the notice on the bottom. No note or mail saying to wait until the holidays - still it's going to be set under the Festivus Pole to be officially opened at a closer date (cause I can't wait until Xmas). Thank you Santa Grogs, you're the BEST!! Wow...just WOW! I am blown away, my Santa got me everything on my wishlist but the hard to find game (Which Im not complaining in the slightest). 4 arrived today, the last one is scheduled to arrive before Christmas he said. Who ever you are THANK YOU! 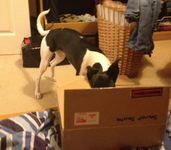 Hope you and the others enjoy these pictures of my Daughter helping unpack my box. We enjoy getting new games together. 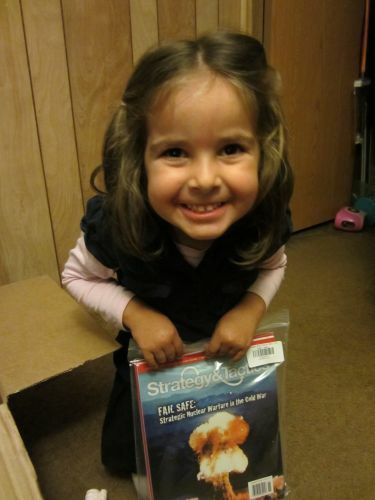 And she gets a big box with plenty of packing peanuts to play with! I told her I was thanking my SS and she said she wanted to thank you too, I told her I would make sure to tell you she said so. My Santa Grogs was on the ball! A deceptively heavy box was on the doorstep last night when I came home from work. I'm seriously jazzed about Bomber Command. LBW is the Man when it comes to airplane games and this is in my sweet spot for game length and complexity. Looking forward to playing it soon! Besides Bomber Command, there was Panzer: Game Expansion Set, Nr 1 – The Shape of Battle on the Eastern Front 1943-45. Panzer is one of my favorite tank games and this expansion adds some cool maps and units. Santa Grog Helper Elf 1711! And a very nice personal letter with descriptions and thoughts about all the games. I'm looking forward to playing Andean Abyss and A Distant Plain (having enjoyed Cuba Libre already). Elusive Victory was completely unexpected, but just paging through the rule and playbook has already been a delight. John (aka Santa Helper Elf 1711), thank you very much. You've truly gone above and beyond. Happy Gaming and Happy Holidays to you too! Santa came via the Polar Express this year! With 2 solitaire versions and a player version, this one should be on the table for quite a while. Thanks, Santa! As usual, you were right on the money! So I had a dilemma. Old Santa Grogs clearly had his snow in one stocking. He fired my gift downrange toward my posit almost immediately. And when the package arrived yesterday, I was undecided as to whether I should open it right away, or show the remarkable patience on which a mature adult like me prides himself. So I put the package away for the night. Morning arrived, and suddenly my ability to wait had disappeared. I ripped that package open, and found Saratoga, a game on my wish list that I'd almost pulled the trigger on numerous times! What a great way to start off the weekend, and how thoughtful of Santa. I started to put the shipping box aside, when I realized that there was more buried under a secret compartment. Well, maybe not really a secret compartment, but I was so excited that I didn't realize there was more. 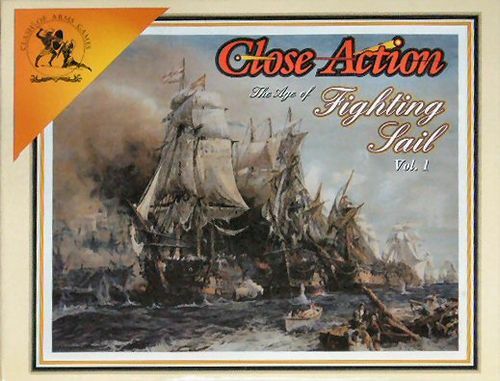 I dug deeper and found Close Action: The Age of Fighting Sail Vol. 1, another item from my wish list. 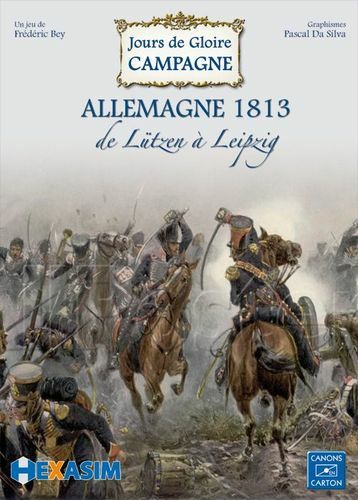 Wow -- 2 games filled with late 18th / early 19th century wargaming goodness! Thanks Santa Grogs for your generosity and your quick action to get these games down the chimney so fast. You've made my second Wargame Secret Santa a huge success! Now to get one of these babies on the table...! So this showed up today with a note on it, that says "Ho ho ho, package 1 of 2. 2nd Reinforcement Drop coming soon!" THANKS A TON SANTA! Will update this entry to show when package 2 of 2 has arrived. Yesterday I received a package from GMT. I though, what is this? I don't remember being charged yet for Blood & Roses or Unconditional Surrender! I didn't expect those to show up for another month or two. When I opened it up, I found Kutuzov! A game that continues to find its way back onto my wishlist after I keep trading it away. Maybe this is a sign that I'll actually get to play this copy!! I have to assume this came from a Super Smart Secret Santa taking advantage of the GMT Sale. Even Elves have a hard time keeping up with those bargains! Fortuitous message from Santa Grogs today granting permission to open Grognards presents upon arrival. While it is possible that this message is from an imposter as it contradicted our original (morse)coded message from Santa Grogs (which directed us to wait until Christmas to open), we are following its instructions anyway. Yesterday an unexpected package from GMT arrived. It was immediately removed by the female of this pair (who has no vested interest in Grognards) for inspection. 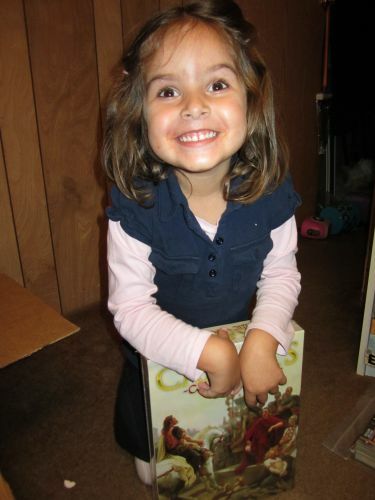 Once she confirmed that it was indeed from Santa Grogs, she hid it away with the rest of the early arriving Christmas presents. Wow, two great air warfare games for an Air Force veteran to enjoy for Christmas. Also, the package arrived in time for Veterans Day. Bonus! Behold a new ensample of hero hearts with patriot pride inflamed, in number'd verses manifold proclaimed. How long this harshness, this unlove, shall bide? * Suffice thee not tear floods thou hast espied? Thou cost prolong our parting purposely * And if wouldst please my foe, thou'rt satisfied! The wife, whether she be a woman of noble family, or a virgin widow re-married, or a concubine, should lead a chaste life, devoted to her husband, and doing every thing for his welfare. I'm not a poet, nor do I have any education in poetry (that I can still remember). So needless to say I went into a tailspin trying to decipher the words of Ol' Santa Grogs. After some mediocre Google research, I thought at first he might be telling me that he hailed from Portugal, as the first two verses are from The Lusiads. After letting me know that I was on the wrong track, further scholarly research led me to Richard Francis Burton, a British man who translated three works from which the quoted verses above all came from: The Lusiads, The Tales of the Arabian Nights, and the Kama Sutra. So I looked into him and saw that he was one of those British guys who had done a little bit of everything (even a quick read on Wikipedia is quite entertaining). I saw that he had joined the British army in hopes of fighting in their First Afghan War and later had been ambushed by Somali tribesmen while traveling in Africa. I made tenuous connections here to a couple games on my wishlist: A Distant Plain and Lock 'n Load Tactical: Day of Heroes. Wrong again, but happily so when I received Santa Grog's blessing to open a box delivered this weekend. Inside was the newest edition of RAF The Battle of Britain 1940 (2013)! I've had this game on my radar for quite a while but for whatever reason have not purchased it. A year or so ago I read With Wings Like Eagles: A History of the Battle of Britain by Michael Korda. It focuses on the role played by Air Chief Marshall Sir Hugh Dowding in fighting and winning the Battle of Britain for the British. I thought it a very entertaining read and I learned quite a bit more about the subject than I had earlier known. Now I'm excited to pull that out and reread it as I learn this game. I have yet to punch anything, but everything in side seems of great quality (doesn't seem to have any problems like the recent reprint of D-Day at Omaha Beach) and looks wonderful. I've already ordered some card sleeves and have an ambitious goal to work through my first game next weekend. I'm very happy to have this game, Santa Grogs! As an enthusiastic solitaire gamer and a developing war gamer I couldn't be happier with this gift. Thank you so much for your generosity. Also, I'm glad you took the time to deliver some taunts my way. Even if I couldn't find the correct path, I did learn a little bit about someone I had never paid attention to before. And as for the verses you sent, well, I can see references to the Battle of Britain and the brave airmen in the first couple verses. Perhaps even the third verse. I'm still mystified by the last verse from the Kama Sutra. Thanks again Santa Grogs! I hope you have a very Merry Christmas and that you have just as thoughtful and generous a Santa Grogs as you were to me! I received a package today from NWS. Since I hadn't ordered a game from them, I could only assume that Santa Grogs had utilized their services. I was excited to open up the package to find a copy of Space Empires: 4X. This is a game that I have been interested in for quite awhile. Now I'm off to read some rules. Thank you Santa Grogs! and Merry Christmas and Happy Holidays to you and yours. Santa Grogs told me I'd have a delivery coming, along with a couple extra stocking stuffers that would arrive separately! So I received a couple of packages over a couple of days, and once they'd all arrived, naturally I couldn't wait to see what was in them, so I tore into the boxes and discovered treats! Christmas in November! 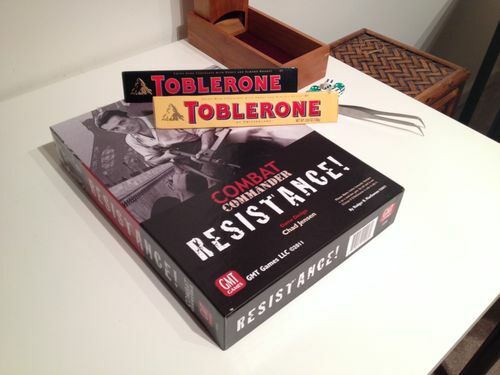 A copy of Combat Commander: Resistance and delicious Toblerone bars! What to my wondering eyes should appear but a box brought by USPS and 8 invading DPRK Divisions. This was my number one wish so I'm really happy to get a new operational level game to tinker with. Santa Grogs also provided fleet reinforcements for my Klingon Fleet with an extra Star Trek: Attack Wing – I.K.S. Gr'oth Expansion Pack. I got a message last week with some strange numbers that I was to figure out. Turns out they were UPS tracking numbers! Now, last Wednesday I visited the doctor as I was feeling quite bad and found that I had the flu and had to lay out of work for three days. So, I had Thursday, Friday, Saturday, Sunday, and Monday to lay around and get better. The tracking numbers came on Wednesday or Thursday. It was a nice pick me up, but boy did I have a lot of time to think about what I would be receiving! Anyway, the games showed up today and what a surprise! 1805: Sea of Glory is one that I have been looking forward to playing for a while. I had pre-ordered it when it was on the p500 but had to cancel before it was released. Glad I finally have a copy. It looks like a cool game. Sweet! Now I have more options for my multi-player games, and more importantly, more scenarios and options for my solo games. I have one set up that I may reset or add a few new things in to try out. Haven't decided yet, but leaning towards adding some expansion stuff to my next solo game. Wow! Thank you so much Santa! I truly appreciate this. Very generous of you and won't soon be forgotten! WOW!!! Santa Grogs sent me a message the very day that the list was published that my gift was on it's way, but with a "Do Not Open Before Xmas" warning. This afternoon it arrived!! Heavy too..... I am going to honor the request of Santa Grogs, even though my birthday (Nov. 24) falls between now & Xmas. I am posting this to ensure that SG can confirm the package elves did their job. Nice wrapped by the way. I will update this posting on Xmas Day. I got the official green light to open this one early, for my birthday. Officially it is tomorrow, but I will be on the road visiting grandkids, so I tore into it this morning. WOW!!! Now I have something to read on the road. THANKS SANTA GROGS!! You are the best. If you see a bad guy, gun him down. If he's still wiggling shoot him again. There's no wiggling in the Old West! Oh man! This is soooooo awesome! 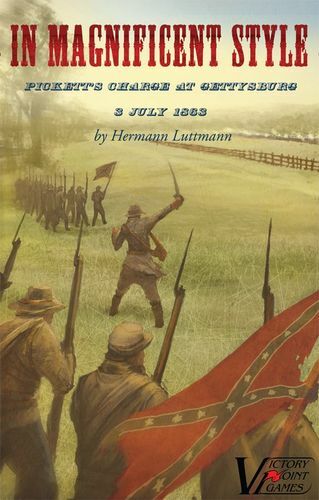 I'm a big fan of John Hill's designs and had a few if his games in the past, but sadly, went though a bad time in my life and sold off virtually all of my wargame collection. Here I am, years later and quite a bit older, trying to rebuild it. Along with all the cool new games that are out and coming out, I'd like to get some of the golden oldies. They are, of course, harder to come by needless to say. This is more than I expected as it is, but Santa has told me that present #2 is on the way!! Wow! This is my first Santa Grogs event and I feel like I'm making out like a bandit here. I should have joined in years ago! Thanks so very much Santa!! Santa Grogs told me I could open my gift whenever I wanted, and I surely wanted to open it as soon as it arrived, today. His taunt mentioned "war paint" so I suspected this might be it, and I'm very pleased that it was indeed! I had seen this get some buzz when it came out but I never actually looked into it until making up my wishlist this year. This sounds incredibly playable, plays from 2-5 people and in a reasonable time commitment. I might even take this to BGGcon with me! Looks like it will make the game even more fun, so thank you! This is going to hit the table right away, because my Dad and I are such huge baseball fans! Santa Grogs, where ever (and whom ever) you are, I Wish You a Merry Christmas and a Happy New Year! I finally got the green light to open my package today. I ripped the package open just to find a gift-wrapped game. Opened it carefully (it was really nice wrapped) and found Command & Colors: Napoleonics. I had my suspicions thanks to the sheer size, weight and the fact that it scrambled quite a lot but I didn't know if it was Ancients or Napoleonics. Thank you so much Santa Grogs! Now to get those stickers on and let the game hit the table! Last week I got a geekmail from santa-grogs telling me that he and his elves had found some intel on me that put me on the very good list this year. This behavior made them send me another gift! Today I first got an sms that a package was waiting for me at the local post-office, oh great I thought santa-grogs 2nd gift. When I had brought it home something didn't really seem to be right, according to santa grogs my package wouldn't be gift-wrapped, this was. 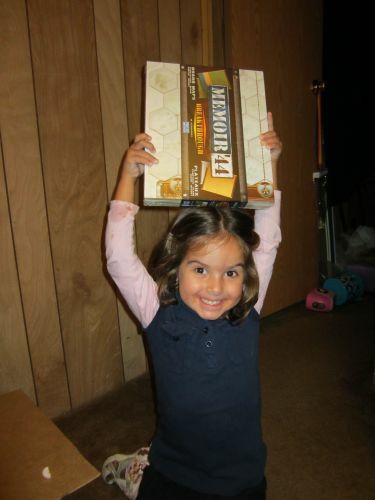 So that package is from my regular santa in the BGG-secret santa exchange. So after a long hard work at my job I got home and checked the mailbox and there was 2 packages, one was Lego Marvel which I ordered a few days ago and one was from Santa Grogs. I couldn't believe it! Both C&C Napoleonics and this! Thank you very very much Santa Grogs, whoever you are I hope you will have a great holiday season. And thank you once again! Santa Grogs is so awesome! I wanted a COIN game so badly and received a copy of Andean Abyss. My SG did make me guess what it was before I could open it, and unfortuantely for me I had to travel away on business - so now I'm anxiously awaiting my arrival back in the US so I can play this game. As if my SG wasn't awesome enough, I received a note about another inbound package expected before Christmas! My SG has made my first Santa Grogs a great experience for me, and I"ll be sure to do it again next year!!! More to come after Christmas! Thanks so much to my SG - wherever/whomever you are!!! I just received a package in the mail today from a sender of unknown origin. I had my wonderful wife open the package to check and sure enough there was a message from Elf "S" inside. I promised to restrain myself until Christmas to look inside the box, so for now I get to play Andean Abyss again. Thanks to my SS again for making this a memorable experience!!! Ok - So I got to open the mystery package from my Santa Grog this morning and what did I find..????? Thanks Santa for such an amazing experience and for both COIN games. I can't wait to try this later tonight when the festivities wind down. Merry Christmas! Santa Grogs informed me that my package would be delivered by yesterday. I hoped it would come to my office, but alas the reindeer got lost and brought it to my home instead. Thankfully, they weren't the type of elves who require a signature to leave a package, so it was waiting on my doorstep when I arrived home from work. I opened the shipping container and there was a large box inside. My first thought was "Do I open it?" My second thought was "You're Jewish, and barely that, why would you wait?" It was a very big box, so my third thought was "It's probably A Distant Plain" which was high on my wish list. I'll spare you the other thoughts I had, about feeding the dog and taking off my shoes...soon I got around to the opening of the box and inside was, as you can tell by the item, Field Commander: Napoleon. That was a great surprise! I have heard a lot of good things about this game and really wanted it, and had been holding back because of the price tag. And instead, Santa Grogs got it for me! So now I can finally get around to playing it. Thanks, Santa Grogs! This was an awesome gift! Today in the mail a package arrived from NWS. I had no order coming from NWS. My Santa had been mercilessly taunting me all week. My two-year-old son was with me and yelled, "Box! Box!" . . . just the night before we had opened some presents out of a box for him (sent by a family member), and now he thought *this box* was for him, too. I said, "No, for Daddy." He said, "No, No, Me." So I am provisionally regifting these presents to my son as his first wargames . . . but I'll hang on to them until he's old enough to play them, and I'll *of course* have to play them myself to make sure that he will like them . . . Thank you so very much, Santa. You have made two little boys (one real, one at heart) very happy this holiday season! 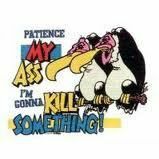 After being alerted by Santa Grogs to be on high alert I was excited by a package note in my mailbox yesterday, but wait! Was this going to be Santa's bounteous gift (he had promised me Monopoly) or was this the Age of Industry boards I'd ordered from the BGG store? When I picked the parcel up there was no doubt, the big SECRET SANTA marked on the outside of the box left me in no doubt. Can I open it dad? Theres a lot of things to chew in here! I don't understand, where was the ham you promised? All of which go onto the 'must play ASAP' pile. Santa Grogs sent me some Great Battles of the American Civil War. I found the box in between my front doors this morning. The poor counters they must have been soo cold over night. 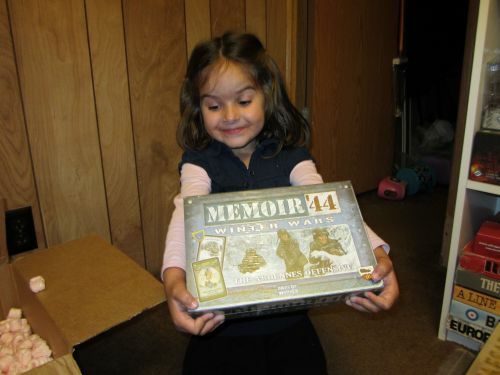 BUT WAIT today another small box arrives from Lost Battalion Games. I didn't order anything and it's too small to be my Kickstarter package. Santa Grogs had struck again. This time with a German MG42 teams and an American BAR team for Sergeants Miniatures Game: Day of Days. My opponents at WBC next best watch out as I'll be bringing a little extra firepower with me in 2014. Our Tiger! She drinks fuel like it's beer! Ha! They're scratching your paint job Helmut! I just received the wargame (A&A IS a wargame ^^) on top of my wishlist. Santa Grogs, you're the best! Merry Christmas and a jolly good year to everyone!